Two goals weren't enough for NYCFC on Saturday as they dropped all three points to the Chicago Fire. Chicago Fire: Sánchez; Corrales, Vincent, Campbell, Campos; Schweinsteiger (Tchani, min. 85), McCarty, Bronico; Collier (Adams, min. 66), Nikolic (Gordon, min. 72), Katai. New York City FC: Johnson; Sweat (Lewis, min. 75), Callens, Ibeagha, Tinnerholm; Ofori, Ring, Moralez; Medina (McNamara, min. 90), Berget, Tajouri-Shradi. SCORE: 1-0, min. 6, Nikolic. 1-1, min. 36, Tajouri-Shradi. 1-2, min. 40, Berget. 2-2, min. 47, Katai. 3-2, min. 53, Katai. On Saturday, Domènec Torrent lead his New York City FC team into an away match for the first time in his young MLS managerial career. Their opponents, Chicago Fire, are unbeaten in their last six games in all competitions including two US Open Cup games in which the knocked off the Columbus Crew and Atlanta United. NYCFC were trying to make it two wins from two following Patrick Vieira's departure from the club. 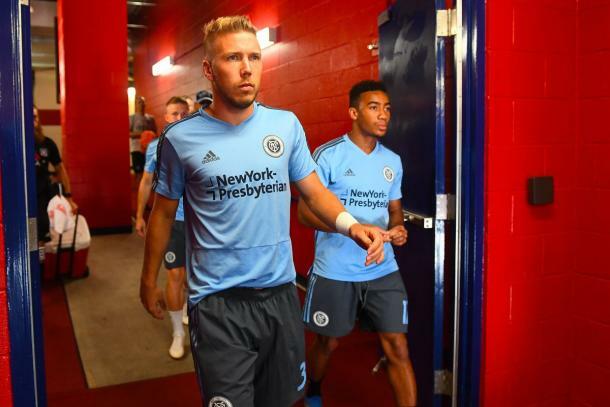 Their first match under Domènec Torrent saw NYCFC grab a come-from-behind win over Toronto FC as Jo Inge Berget's brace upped his season goal tally to three. It took just six minutes for the hosts to take the lead and for Nemanja Nikolic to slot home his sixth of the season. Dax McCarty picked up the ball following a weak giveaway from NYCFC and played the Hungarian through on goal. As MLS fans have come to expect, the 2017 MLS Golden Boot winner made no mistake and put his side ahead. Also something MLS fans could come to expect is NYCFC out-possessing their opponents and looking to dominate the match, and that's exactly what they looked to do following the goal they conceded. NYCFC passed the ball around smoothly on the Toyota Park surface which saw a big moment come shortly after the 20-minute mark. Jo Inge Berget picked up the ball around midfield and led a break. Maxi Moralez on his left, and Alex Ring on his right, Berget chose the former. Maxi's touch took the ball away from Jonathan Campbell who came crashing in causing NYCFC to shout for a penalty. Unfortunately, from the NYCFC point of view, there was no call and the Boys in Blue had to settle for a corner kick which eventually resulted in nothing. Finally, just a handful of minutes after a brief hydration break, Ismael Tajouri-Shradi leveled the scoreline. The Libyan picked the ball up from a Moralez pass near the sideline, cut it onto his left foot and sent a low drive past a diving Richard Sánchez. Just a few minutes later, a Nordic connection gave NYCFC the lead as Jo Inge Berget made it three goals in two games heading home an Anton Tinnerholm cross. For the second time in two weeks, Berget played a roll in NYCFC coming from behind to take the lead. Just two minutes into the second half, Aleksandar Katai matched Nikolic with his seventh goal of the season. The Serbian came down the right wing, spun Ben Sweat and rocketed home the equalizer. Katai showing NYCFC what he's been showing the rest of the league for the whole season as he scored his second of the match just seconds later. A few touches saw him beat a sliding sweat and Alexander Callens before slotting it past Sean Johnson. After taking control of the game once again after going down, NYCFC hit the bar in the 73rd minute. Similar to the first Berget goal, it was a ball dinked into the box and once again finding Berget's head. Unfortunately for NYCFC, this one hit the crossbar and the score remained 3-2 in the host's favor. Jonathan Lewis nearly equalized for the visitors in the 84th minute when his volley from close range went just over the bar. That was NYCFC's last big chance and they were forced to go back to the Big Apple with zero points. David Villa who had four goals in the last three meetings with the Fire turned out to be a big miss for Domè and NYCFC. For the hosts, they alternate home and away matches over their next three games. First, they'll travel up north to take on the Vancouver Whitecaps before returning home to face the Philadelphia Union. Finally, they return to the road to face FC Dallas. For NYCFC, they'll be preparing for Domè's first Hudson River Derby as NYCFC gets ready to host the New York Red Bulls. After that, they remain at home to host the Columbus Crew, and then the Montreal Impact.